Mud. It’s the time-digested and sopping residue of mountains, trees, bodies, roads and cities all ground into dust. Artists working in clay touch that transformed history. Some even sculpt and shape it in ways that encourage us to remember parts of it. The three sculptors in “Large as Life” make figures out of clay that have a kind of abiding reverence for organic nature not only of the muddy material but also for the lives and history composted within it. There is a sense of protective pathos in Lisa Reinertson’s impressive naturalistic sculptures of human and animal interrelatedness. “Neptune’s Daughter” is a six-foot high figure of a windblown, chalky white young woman gently cradling a large pelican in her arms. Both the front of the girl’s dress and the entire bird are drenched with a vivid, wet looking stain of brick-colored glaze that reads both as muck and drying blood. The figure looks away, as if gazing into a distance that we cannot see, with an expression of absolute calm that is both alarming and hopeful. As a meditation on human responsibility for the natural world’s oceans and what we’ve done to them, it’s a potent piece. Reinertson pushes the inter-dependency between human and animal in several ways. Mutual vulnerability is a key theme in pieces like “Woman with Lemur,” where the lovely seven foot high naked woman determinedly balancing on one foot tries to partly cover her breasts while grasping reflexively at the dangling tail of the small endangered animal sitting on her shoulder. In other pieces the artist inverts accepted notions of the natural order by undermining our expectations. “Sleep of Reason” places a seated mother gorilla holding her furry baby atop a pedestal shaped from the burnished backs of several intertwined human bodies. We are accustomed to decorative tropes that support the idealized human form on the backs of rampant plants or wild beasts. By switching the hierarchy we begin to see the mindset that underlies that tradition. 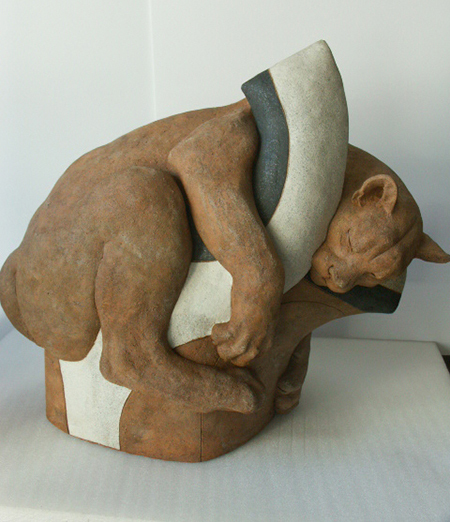 The idealized animals in Betty Davenport Ford’s stoneware sculptures are refined abstractions that speak of the dynamic animation to be found in carefully observing a creature’s motion and form. There is an unpretentious grace and relaxed strength to the way Ford draws postures, poses or anatomy. It renders her animals at once completely natural, but also transformed — as if in turning the animal into clay the artist has found its inner dancer. “Hooded Gibbon” is a wonderfully smooth and angular seated ape stretching out a long, massive arm to reach for a fruit. Its body is glazed a café latte brown, flecked with nutmeg specks. The gently worried face is a small chocolate flame of expression framed by a tan mountain of sloping shoulders. In the beast’s simple, refined countenance, the clay feels amazingly alive. A simple gesture also animates the three reddish swimmers turning as they dive for fish in tall green reeds in the stoneware piece “Otter Fountain”. The artist gives us the vibrancy of moving water in this work, making the undulating forms of the playful creatures and surrounding vegetation embody the transparent liquid that submerges them. Stretching out, twisting, bending and turning to sniff at each other they have a naturalness that feels entirely authentic and modern even as it recalls to us the close observational accuracy found in ancient cave drawings of wild animals. Elaine Katzer’s naturalistic ceramic animal and human head or bust sculptures exude an air of compressed, condensed life. It’s as if the artist regarded the expression “clay body” to be something more than just a description of the medium. Forms are tight and compact, as if still wedded to the lump clay that started them. We feel that most strongly in sculptures like the beautifully curved “Mute Swan,” the rampant “Young Elephant” peeling away from its back support and the muscular “Cougar Totem” seemingly fused to the abstracted tree it is sleeping in. These and her other rounded sculptures turn a lump of solid clay into unfolding or tightening balls of compressed energy intimately tied to the medium’s unadorned earthy color.